Have you ever overcome the boundaries of time and space? Today I’m going to share with you an otherworldly place that allows you to easily overcome the boundaries of both space and time, leaving traffic far behind. We’re going to leave the modern world behind and enter the world of the Ming Dynasty over 500 years ago. I had only been in Portland for a few days when I first laid my eyes on the entrance to the Lan Su Chinese Garden, the prime Chinese cultural heritage site in the region. The Lan Su Garden encloses a full city block and was created in the style of Portland’s sister city, Suzhou; and its presence created a beautiful contrast to the western architecture around it. Surely, its high walls must have been protecting a hidden world inside: a world that I would soon see. 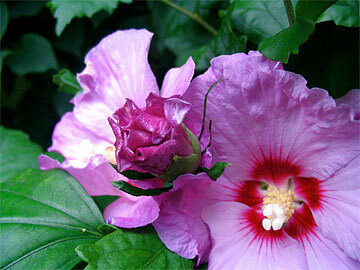 The name “Lan Su” is from “Lan Su Yuan” which means Garden of Awakening Orchids. And even from the outside, the sense of sacred ground gave the air a texture of charged mystery. At the time, I didn’t know that these types of gardens are often referred to as living landscape paintings in which the Tao itself is said to overwhelm the people inside; but now having been inside, I can see why. Uncounted serpentine walkways lead through strangely-shaped passages. A zagging bridge juts across the meticulously-designed Lake Zither. And special Lake Tai stones sit quietly all around, carefully placed to appear as tall mountain peaks throughout the Garden’s landscape. In fact, over 500 tons of stone were shipped from China to create the Garden, and the effect was unmistakeable. I looked down at Lake Zither and saw pink lotuses. They seemed perfectly placed, and later on I learned that lotuses were placed in Lake Zither because they symbolize the essence of purity. As they sprout up from the bottom of the muddy lakebed, they are cleansed as they grow though the water and eventually emerge above the lake in their full beauty. 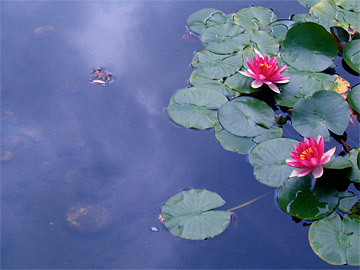 To the Chinese people, the lotus symbolizes rebirth through the life cycle of bud, blossom, and seed pod. 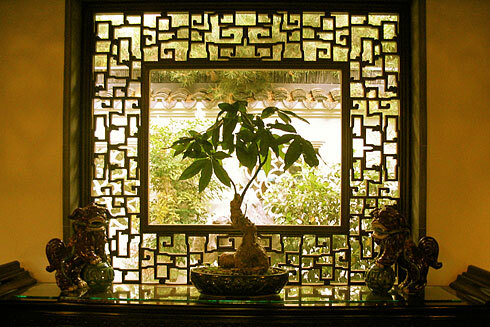 In a Chinese garden each species of plant is carefully chosen for its symbolic value. Pine, flowering plum, and bamboo are all included in the Garden and are collectively known as the Three Friends of Winter because each plant adapts the winter well. To the Chinese people, they are living examples of the virtues of strength, flexibility, and integrity. In fact, the Garden contained over 500 species of plants, and over 90 percent of the Garden’s plants are native to China. With that in mind, it didn’t surprise me that over 70 Suzhou craftsmen lived in Portland for nine months to carefully build Lan Su Yuan. The attention to detail was immaculately authentic. I continued wandering around the enlightened landscape. Everything was meticulously designed and thought out in advance. There was poetry in every element. Inside one of the small buildings, I admired an expertly-trimmed bonsai tree set between two small Chinese dragon figurines, and I was amazed at how standing in that room truly did make me feel as though I was in the East. Here, water complemented stone. Shadow offset light. Interiors and exteriors were balanced, all to manifest the Tao, or Way of Nature. In the distance, I heard the sound of a waterfall cascading over rocks, and the noise of the city was no more. Around me were jasmine, wintersweet, and osmanthus flowers that awakened the senses through all seasons. It may surprise you to learn that there are a number of small buildings within the Lan Su Garden, but this is normal for a garden created in a Ming dynasty style because these gardens were traditionally part of the extended living space for a wealthy family. Placement of these small buildings is considered the most important element in the layout of the garden in order to harmoniously integrate architecture within the natural world. To say that the builders of the Garden were clever is an understatement. They deliberately used many different traditional building forms to make the Garden appear larger inside than ever could be imagined from the outside. But for all its mysterious spaciousness, my favorite elements in the Garden were the small details. A key detail of Lan Su Yuan, a detail that some completely fail to notice, is its poetry. In Chinese tradition, a garden can boast majestic lake stones, hundreds of plants, and amazing integration between architecture and nature… and it all would still be incomplete without poetry. Thankfully, Lan Su Yuan is indeed complete, enchanted with an abundance of poetic inscriptions. 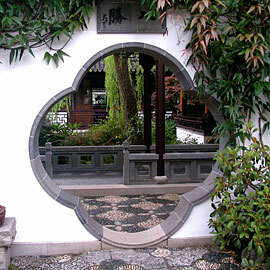 All around the Garden, you can easily discover poetry engraved onto huge stones, doorways, buildings, and pavilions. Granted, unless you can read Chinese you probably won’t have any idea what the poetry is about, but the mere presence of these poems lends a unique energy to the Garden. And if you ask politely, someone nearby may even be able to tell you what one of the engravings means. 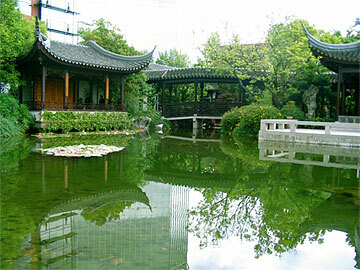 Traditionally, the owners of gardens like these were scholarly officials in the Ming imperial court who had grown up within a culture that valued the craft of poetry writing and recitation highly, so poetry was naturally included in these gardens to add another level of intellectual pleasure to the visitor’s experience. Poetry allowed conversation across time and space between poets, as well as between gardens. Which is the greater poetry? Khalil Gibran once wrote: “Beauty is Life when Life unveils her holy face”; and I believe that this veil is pulled away, if only partially, within this Garden’s walls. Once you allow yourself to calm your mind, the Lan Su Chinese Garden can and will transport you across time and space, to a place of great wisdom and quiet reflection. That is why I highly recommend that anyone who values beauty or wisdom visit the Lan Su Yuan. A visit to Portland would certainly not be complete without it. Before I left the Garden, I took some time to appreciate a small violet flower just before it bloomed. I captured that moment, and the photo above is the last picture I took before I left. I’m grateful that it turned out so well, because it captures a piece of the poetry of the Garden that my words cannot. Perhaps even greater than the Chinese poetry engraved on the Tai stones, is the poetry in the tiny details that are more often overlooked. For is there not even more poetry in a flower about to bloom? Truly in the midst of the city there can be mountain and forest. Photos from this trip are in the Lan Su Chinese Garden album. All photos in the Gallery can be used as desktop wallpapers because they are high resolution (1920×1440). great place to visit…a place with soothing and greenery environment.